For the past 20 years, Desperados brand has teamed up with the urban art collective, 9ème Concept, to design its iconic “Original” bottle. For their 19th cooperation, Théo Lopez and Desperados are stretching the limits of artistic creation. Beyond the label’s design, the artist conceived a unique experience that enables us to explore his artwork from the inside thanks to virtual reality. The experience is accessible on the “Desperados FUTUREDITION” app, to be downloaded on smartphone. A new artist has designed the Desperados limited edition label each year, for the past 20 years. Upon the 2018 edition, the label becomes only the start of the story. 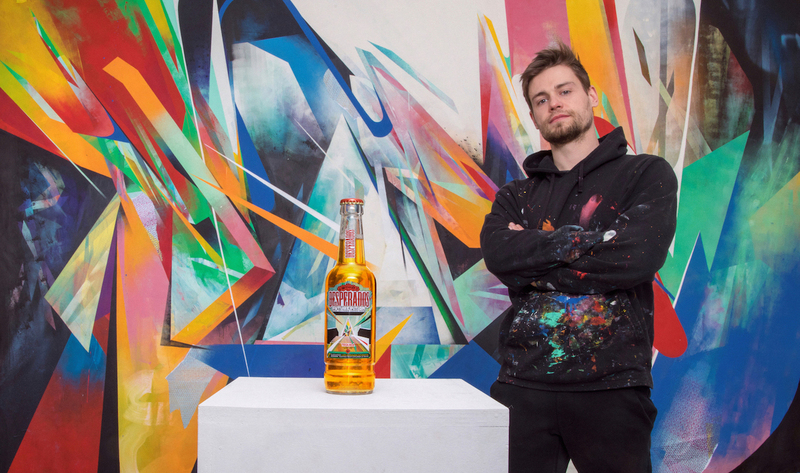 By scanning the bottle with the “Desperados FUTUREDITION” app, Théo Lopez’s creation is unveiled in virtual reality, and you can explore every layer of the artwork, from every angle. With his paintings, this 28 years old artist plays with superimpositions of colors and materials to create new shapes. The “FUTUREDITION” project aims to dissect his creative process in order to turn his canvas into a VR experience. The mobile app offers a unique experience with a combination of various technologies (augmented reality, virtual reality, mixed reality) and reveals a digital documentary that walks you through the backstage of this innovative artistic collaboration. A close cooperation for almost 20 years. Since 1999, Desperados gives carte blanche to 9ème Concept to rethink its iconic bottle design. Based on a joint wish for constant renewal, this singular cooperation has already generated 73 limited editions. Each one of them is an original creation of an artist. In 2017, the brand already started its digitalization with the “Augmented Edition”, a piece designed by the artist Matthieu Dagorn, and developed with the Google Tilt Brush technology. To cut, break, draw, shape, cover, add, scratch, conceal, and unveil. Théo Lopez thinks like a sculptor, he likes what’s random and chance inspires him. The layers merge, the colors interact, the lines vibrate and communicate, and the painting starts to take form.